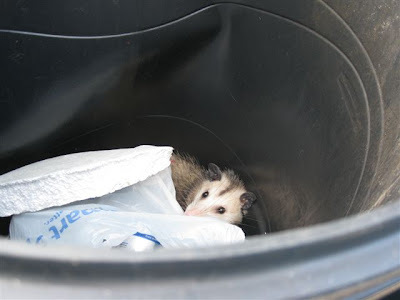 "This morning after survey when we were dumping our trash, we heard a hiss from the trash can. 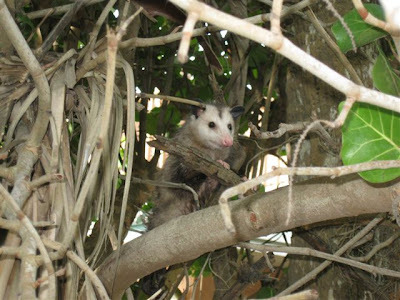 When Alex looked in the can, she saw this opposum staring at her. He was quite upset to have styrofoam thrown on him. We decided to tilt the can and let him out. First, lots of cans and bottles and alcohol-smelling liquid fell out, and then out came the possom, soaking wet and reeking of beer. He staggered over to the sea grapes and eventually climbed up on a limb. At first we thought he was sick or injured, but he seemed to recover pretty quickly. " Well, the title would have rhymed better if it had been a skunk, but we certainly thank Ann for saving the inebriated possum and sending us the photos! Oh, that is too funny! An Opossum smelling like beer. Ha!